The USGS Texas Water Science Center maintains a network of continuous record gages and crest-stage gages on small watersheds in Western Texas. Data collected from these gages provides the Texas Department of Transportation with valuable watershed rainfall and runoff information to support their hydrologic research program. USGS Texas Water Science Center has established a network of over 40 crest-stage gages within the small rural watersheds of western Texas. For most applications, such as station placement at culverts, an upstream and downstream crest stage gage is in place to record peak head and tail water conditions. provide a low-cost method for gathering sufficient long-term data over a wide area to support reliable statistical analysis of peak-streamflow frequency. Approximately 20 years of record is needed to mitigate for sampling and climatic variability and to increase the reliability of site-specific flood frequency values. What is a Crest Stage Gage? The crest-stage gage is a simple, economical, reliable, and easily installed device for obtaining the peak stage in a stream after a storm event. Although many different types of crest-stage gages have been tested, the most functional one is a vertical piece of 2-in. galvanized pipe containing a wood or aluminum staff held in a fixed position with relation to a vertical datum. The staff rests on top of a pin in the center of the bottom cap attached to the pipe. The bottom cap attached to the end of the pipe contains granulated cork and has holes to allow the water to enter the pipe. As the water rises inside the pipe, the cork floats. When the water reaches its peak and starts to recede, the cork adheres to the staff inside the pipe, thereby retaining the peak stage during the event. The peak water surface elevation is obtained by adding the bottom cap pin elevation to the distance from the bottom cap pin to the peak stage mark. Project research results and data. 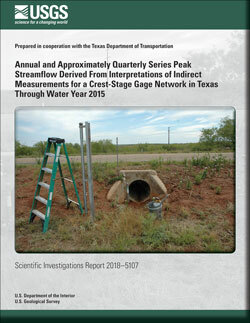 Asquith, William H.; Harwell, Glenn R.; Winters, Karl E.
Asquith, W.H., Harwell, G.R., and Winters, K.E., 2018, Annual and approximately quarterly series peak streamflow derived from interpretations of indirect measurements for a crest-stage gage network in Texas through water year 2015: U.S. Geological Survey Scientific Investigations Report 2018–5107, 24 p., https://doi.org/10.3133/sir20185107. Harwell, Glenn R.; Asquith, William H.
Annual peak streamflow and ancillary data for small watersheds in central and western Texas; 2011; FS; 2011-3082; Harwell, Glenn R.; Asquith, William H.